Located in the Caribbean Sea, Haiti covers an area of 10,695 square miles (27,700 square kilometers) and occupies the western third of Hispaniola, the second largest island of the Antilles. Haiti shares the island with the Dominican Republic, but the two neighbors have little in common. Haiti's population has French and African cultural roots, while the Dominican Republic is more closely associated with Latin America. Despite its beautiful island setting, Haiti is marked by increasingly desperate poverty amid frequent political instability and heartbreaking public health conditions. The second oldest republic in the Western Hemisphere after the United States, Haiti entered the 21st century burdened with the highest prevalence of HIV/AIDS of any region outside sub-Saharan Africa. The capital of Haiti is Port-au-Prince. 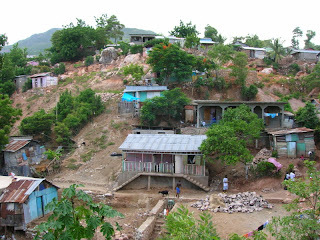 Haiti possesses some of the most rugged terrain of the Caribbean islands. Indeed, the topography of the country is reflected in its name, which derives from the Arawak word Ayti, which means “mountainous land.” Its mountain systems and the parallel ribbons of lowland that separate them are oriented in an east-west direction. To the north there is the Massif du Nord, which belongs to the main mountain backbone of Hispaniola (called the Cordillera Central in the Dominican Republic). To the south there is a long and relatively narrow mountainous peninsula formed by the Massif de la Hotte and Massif de la Selle. The latter contains the country's highest peak, Mount Selle, 8,773 feet (2,674 meters) above sea level. Between the mountain regions, central Haiti is characterized by alternating uplands (Chaine des Mateux and Montagnes Noires) and lowlands (the Cul de Sac, the valley of the river Artibonite, and the Plaine Centrale). 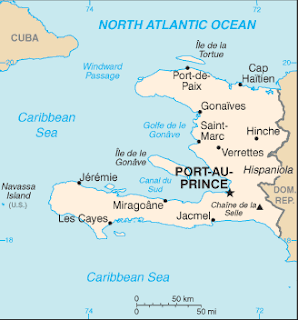 The capital, Port-au-Prince, is located in the Cul de Sac depression. 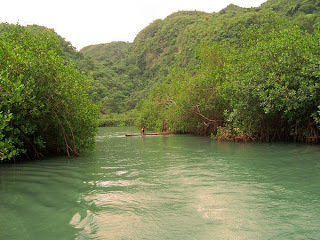 In the northeast around Cap-Haïtien there is a patch of lowland called the Plaine du Nord. The complexity of terrain is matched by a wide variety of climatic conditions. Tropical conditions resulting from the low latitude of between 17° N. and 20° N. are modified by the trade winds, the surrounding ocean, and high elevations. In most areas, however, temperatures are moderately high and vary little from season to season. Rainfall is normally higher on mountain slopes that receive the northeasterly trade winds and decreases on leeward slopes and in the major valleys, especially in the Cul de Sac and the Artibonite Valley. The lowlands of central Haiti are so dry that fields must be irrigated for crops. Prolonged droughts in 1965, 1975, 1977, and 1980 affected coffee and sugar exports and led to a severe food shortage. Hurricanes also had a devastating effect on Haitian agriculture in 1979, 1980, and 1998. Earthquakes are another hazard. Port-au-Prince was destroyed twice in the 18th century, and Cap-Haïtien had a similar fate in 1842. Haiti was once almost entirely covered with pine, hardwood, and mixed pine-hardwood forests, but fire, uncontrolled cutting, and the conversion of woodland to agriculture destroyed most of the trees. Firewood is still the principal source of energy. Some pines, mahogany, cedar, and rosewood still exist in the humid upper mountain ranges. There are also wild varieties of coffee, cacao, and coconut trees with many native tropical fruits, including avocado, orange, lime, and mango. The vegetation of subhumid areas such as the Artibonite Valley is generally savanna with scattered palms. The Cul de Sac and other arid zones are characterized by cactus and thorn scrub. Many species of insects are found, but there are no large mammals or venomous snakes. Ducks, guinea hens, flamingos, and wild pigeons are common. With a population density of roughly 660 persons per square mile (255 per square kilometer), Haiti is one of the most densely populated nations in the world. Opportunities for employment are scarce, and roughly three fifths of the population lives in the countryside. 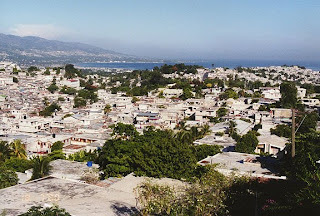 Like the capital cities of most developing countries, Port-au-Prince has grown rapidly; the metropolitan area now has more than 1.5 million inhabitants, many in shantytowns surrounding the city. Other major cities are Cap-Haïtien, Carrefour, Delmas, and Pétionville. The inhabitants of Haiti are descendants of African slaves brought by French colonists to grow sugar in the 17th and 18th centuries. Ten percent still speak French, and most are nominally Roman Catholics, but the culture retains African roots. Ninety percent speak a Creole patois that is basically a mixture of French, Spanish, and English. Most Haitians practice voodoo, a combination of African and Roman Catholic beliefs that involves rituals of dance, music, magic, and cults of the dead (see voodoo). The staple elements of the diet are corn, cassava, millet, rice, and fruits. 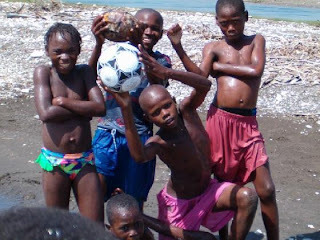 The average annual income of most urban Haitians is roughly 300 dollars; thus protein sources such as meat, fish, or eggs are rarely consumed. More than 80 percent of the rural population lives below the poverty line, and malnutrition is high. Malaria, tuberculosis, and hepatitis are endemic, as is infection with HIV. On average, there is one physician for every 10,000 people; in rural areas, the ratio is much greater. Literacy is low among Haitian adults; less than half are able to read and write, and more than half have received no formal schooling. Class sizes are large, especially in rural areas, and schools are poorly equipped. Some two thirds of primary school age children attend school; of those, less than half will reach the sixth grade. 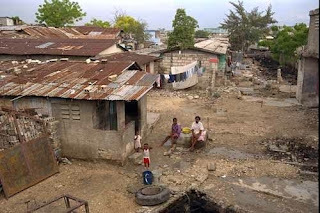 Haiti is the poorest country in the Western Hemisphere. The economy is heavily dependent on farming, which employs a large percentage of the labor force; however, only a third of the land is considered suitable for cultivation. Ever since the French sugar plantations were destroyed in the struggle for independence, Haitian agriculture has been carried out mainly on small peasant farms that became increasingly fragmented through inheritance. Cultivation is principally by hand, using such simple tools as hoes or machetes. Few farmers can afford fertilizers or insecticides. The low productivity does not keep up with the large annual population growth rate, and thus a large portion of the nation's food is imported. The principal cash crops are coffee, sugar, sisal, and essential oils. Mangoes are an important export, as is coffee. Sugar production has fallen dramatically because of growing local consumption and the production of rum. The industrial sector is small and concentrated in Port-au-Prince. There are a few medium-sized factories, which produce cement, cigarettes, malt beverages, refined sugar, and oils. The most significant development from the 1960s has been the rapid growth of light industry, which produces roughly one quarter of Haiti's export revenues. 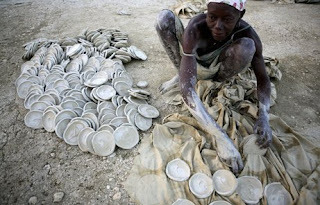 Many foreign companies have been attracted to Haiti by the low cost of labor, the absence of employment legislation, and exemption from taxes. Most light industries specialize in the labor-intensive assembly of components shipped from the United States to produce sports goods, clothing, toys, and electrical goods. Haiti's industry now employs almost 6 percent of the labor force. Additional revenue once came from bauxite mines, but resources have been exhausted, and the aluminum company closed its Haitian plant in 1983. 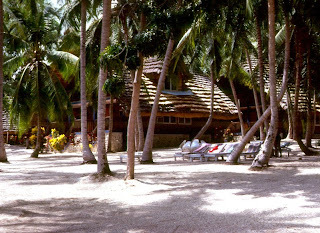 Another major source of income, the tourist industry, has had severe difficulties since 1980. The nation's road system consists of approximately 2,500 miles (4,000 kilometers) of main roads, of which 24 percent are paved. Most unpaved roads are impassable in the rainy season, and produce for local markets is largely transported by burro or by humans.